From Belgium, he made our way to Germany. 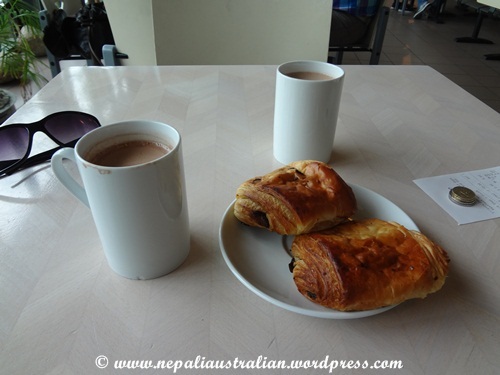 After a while on the bus, we stopped for coffee and croissant in a cafe and it was the first place where we had to pay money to go to the toilet. Yes, it may sound a bit ridiculous but most of the places in Europe charges from € 0.40 to € 0.60 to access the public toilets. 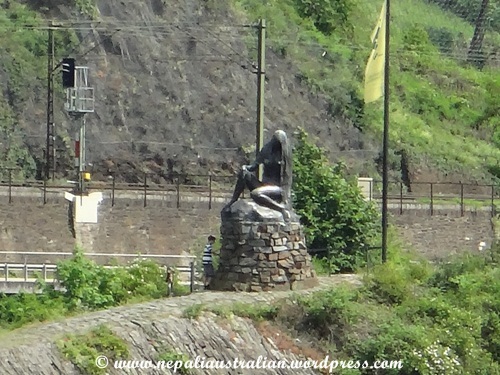 Then we made our way to Sankat Goar via Frankfurt. 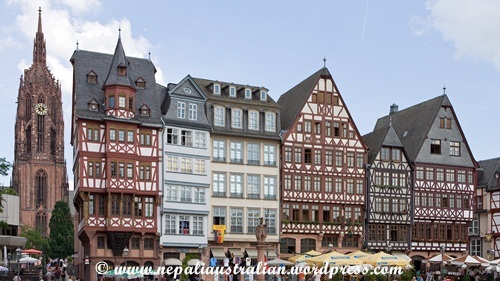 Frankfurt is the largest city in the German state of Hesse and the city is at the centre of the larger Frankfurt Rhine-Main Metropolitan Region .Frankfurt is the financial and transportation centre of Germany and the largest financial centre in continental Europe. 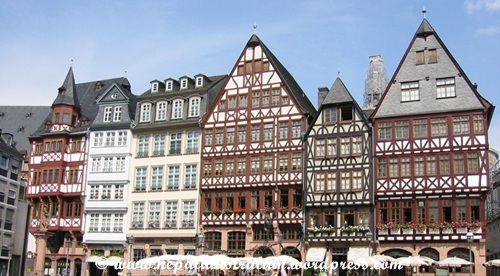 Frankfurt lies in the former American Occupation Zone of Germany, and it was formerly the headquarters city of the U.S. Army in Germany. 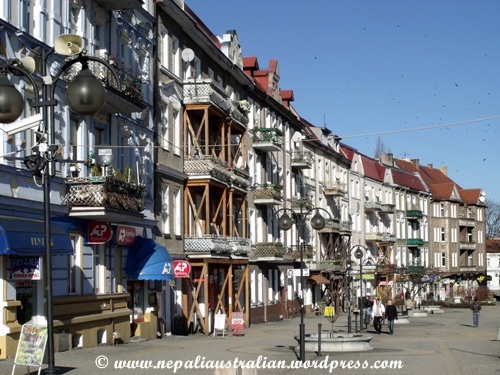 The centre city is very nice, lots of shops, old sections of the city to see, lots of outside cafe’s and very walkable. Sankt Goar is a town on the left bank of the Middle Rhine in the Rhein-Hunsrück-Kreis and it’s well known for its central location in the Rhine Gorge, a UNESCO World Heritage. 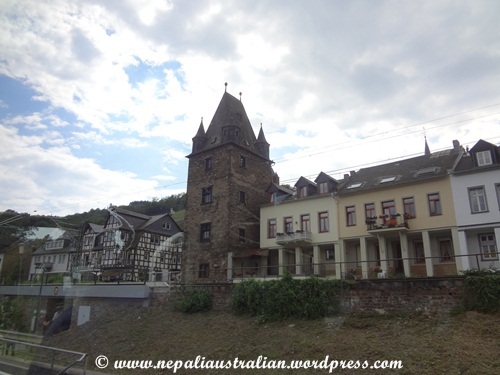 Sankt Goar is lovely, we arrived early in the afternoon, so had some time to wander around before we needed to join the Rhine river cruise. We were lucky to have a beautiful bright sunny weather. We took some photos in front of the church and then went inside to look around. There were a few people praying so we left them in peace and continued to wander around the area. 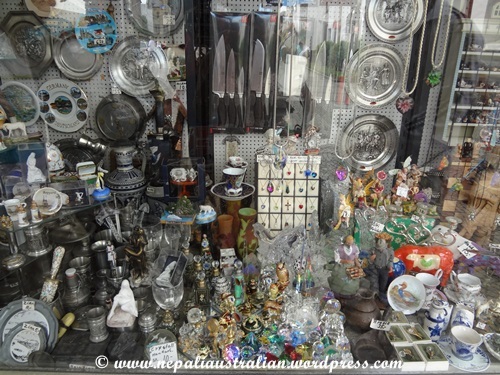 We bought few items from a souvenir shop but were really disappointed by the service. I was not planning to buy any breakables if they didn’t have proper wrapping so I specifically asked if they had boxes to pack them in and the owner said he did. But when I bought the item, they wrapped it in just a newspaper without any box. When I tried telling her that I really needed a box, she was so annoyed and replied, they don’t keep any boxes. I’m glad that the piece came to Sydney in one piece. There were some shops selling really beautiful lace works as well. 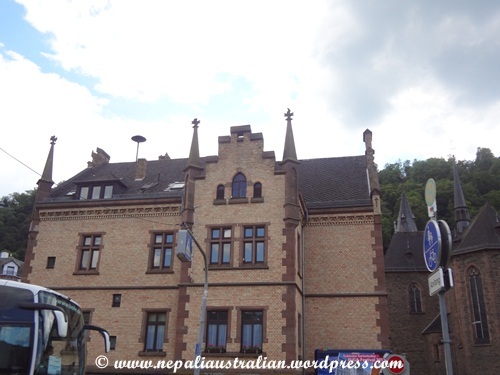 As it was almost time for us to catch the boat for cruise, we made our way towards Rhine River. We had almost 40 people in our tour and there were many other buses that were waiting for the Cruise boat. So when we boarded the boat it got very crowed. As we didn’t get time to have lunch, we went straight to the counter to order something to eat. There was a long queue already and it was almost 30 minutes before we were served. 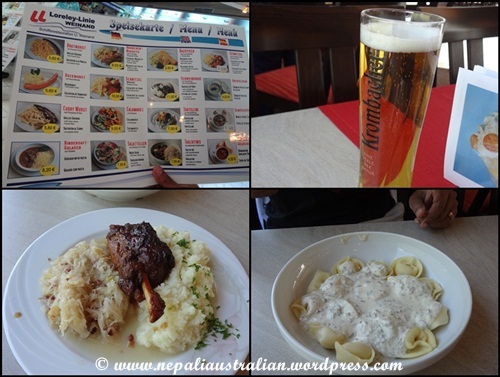 AS ordered a beer and tortellini pasta stuffed with cheese herbal sauce and I ordered orange juice and Schweinshaxe which is knuckle of pork with sauerkraut and mash potatoes. 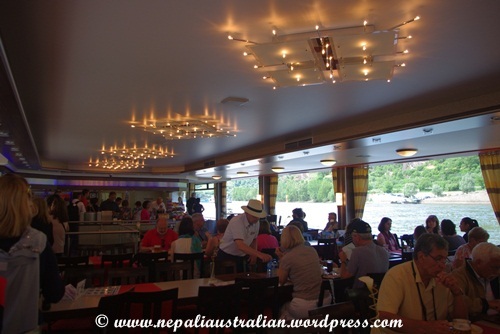 We took a window seat and enjoyed our food with the river view. Once we were done, we went to the top deck to join the other. It was a nice sunny day which made the trip quite pleasant. There was a commentary along the way pointing out some of the main features. 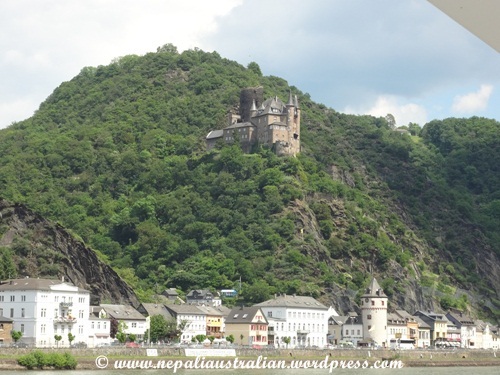 We passed the Castle Pfalz situated on an island mid river and small towns on the riverside including Oberwesel with its stunning mountain top castle/hotel. 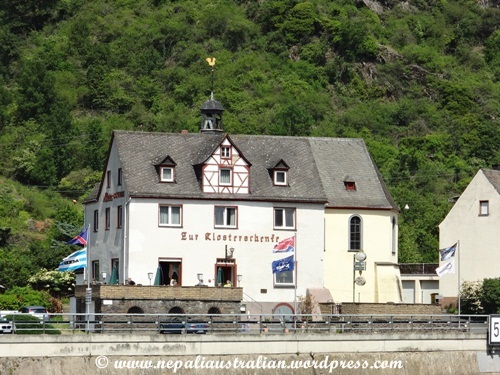 The highlight of the trip was The Lorelei .The mighty slate rock Lorelei in the Romantic Rhine Valley rises up almost vertically to 132m above the water-level. Downstream the river is squeezed into its narrowest and deepest (22m) point, so the Middle Rhine at this point used to be very difficult to navigate and the correct passage is (today) clearly marked with buoys. Even in the 19th century, reefs and rapids made it extremely dangerous for ships to pass this point. The legend tells us, that a siren called “Lorelei” bewitched the hearts of the sailors and when they looked up to the rock, their boat crashed and they sank. Würzburg is a city in the region of Franconia, Northern Bavaria, Germany. 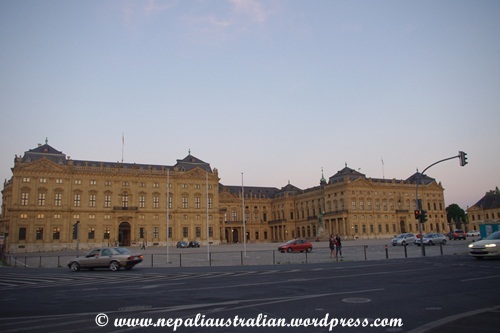 Located on the Main River, it is the capital of the Regierungsbezirk Lower Franconia. 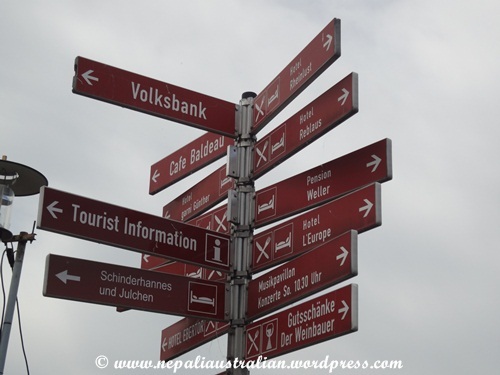 After we settled in the hotel (Novotel) and had our meal, a few of us decided to discover the city by ourselves. 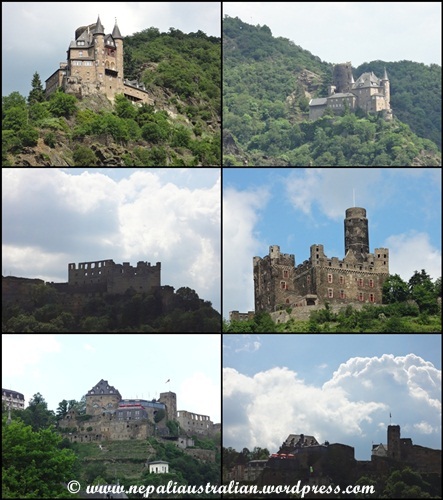 The first stop was Rezidenz, a royal castle which looks pretty much like every other royal castle. 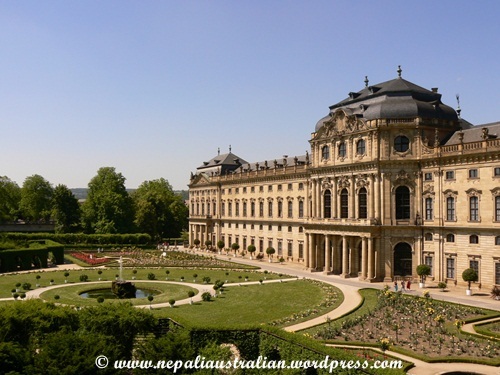 It has beautiful gardens behind the palace. 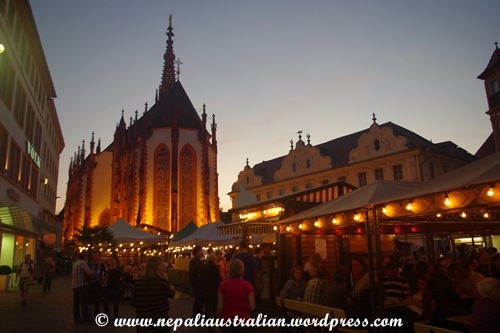 Then we move to the Market square of Wurzburg, where they had Würzburger Weindorf (Wine Festival) going on. There was music, lots of wine stalls and food on display. The square itself looked beautiful with lights everywhere. The square houses most of the city’s top landmarks and it is a charming and pleasant area to congregate as there are cafes, restaurants, shops, and of course the open market where one can delight in the fresh produce and flowers for sale. Due to the wine festival the place was transformed into a giant fairground, food with wine and lots of people. We saw a bridal party having something similar to a hen’s night. She had this box and it has small paper with prizes on them. You needed to pay 1 euro to play the game. Some of us did and there was only one winner who got to dance with the bride. The money was going toward her hen’s night drinks in the evening. It was quite interesting for us to find such a nice culture. Everyone loved the wine and we got a souvenir cup from the place. 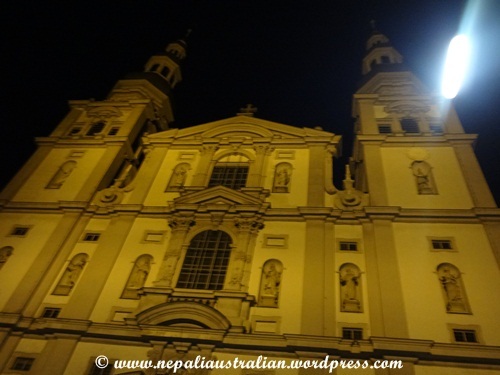 From there we saw a few more historical churches and landmarks on the way back to our hotel. 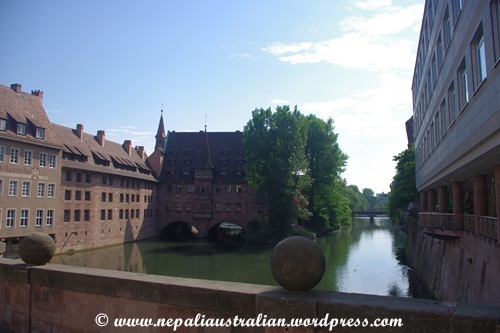 Nuremberg is Bavaria’s second city after Munich. 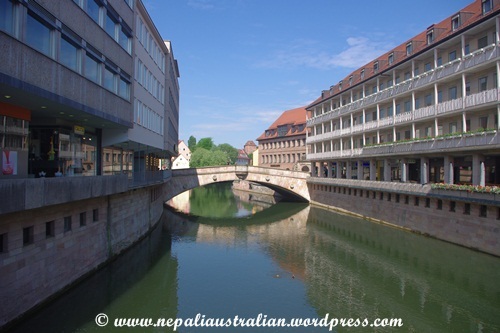 While its history dates to the 11th century, Nuremberg is tied in most minds to the 20th century and more specifically to World War II. It first served as the site of many pre-war Nazi rallies, then was nearly levelled by Allied bombing, then was the site of the famous post-war Nuremberg Trials. 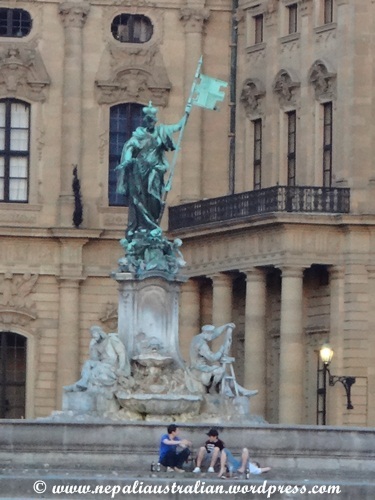 We were dropped off in the central square in Nuremberg. 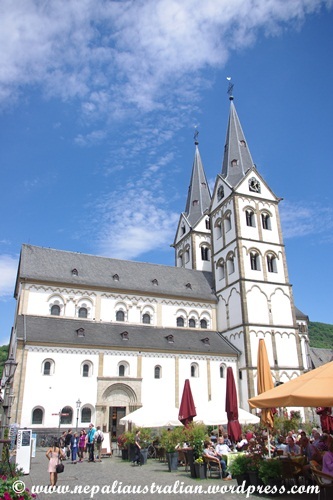 There is this beautiful church called St. Lorenz Church at one end and at the other end there is Der Schoene Brunnen. 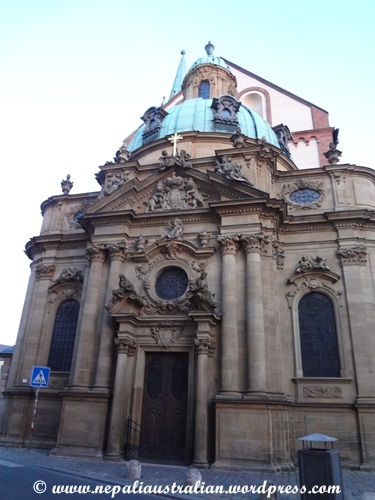 St. Lorenz Church looked so amazing despite it being ruined after the war and was refurbished. 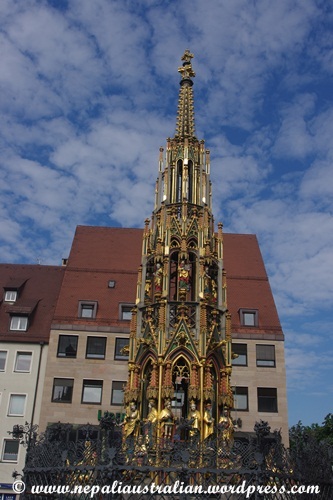 Der Schoene Brunnen is a 19 meter fountain with no running water which originally was erected around 1385. It looked really beautiful in the morning sun. 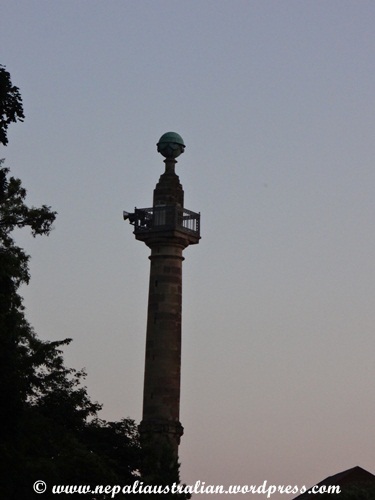 It was originally intended as a church spire for the woman. Two rings are attached at the fountain, said to have been forged from one piece supposedly. There were few cafes and souvenir shops in the square as well. From there we walked around and went to Heilig-Geist-Spital over the river Pegnitz. 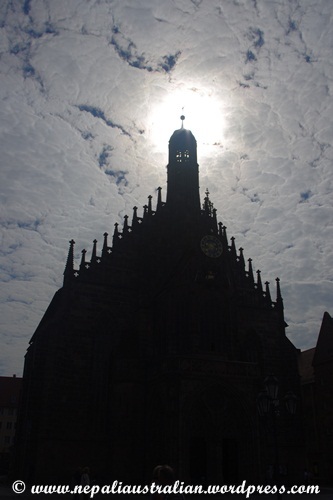 It was one of the largest hospitals in the middle ages for the care of the sick and elderly in the city of Nuremberg. After the World War II, the building complex was razed to the ground. It was situated on an island and has two lovely arches. 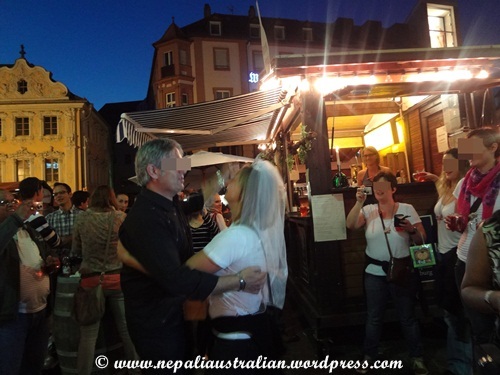 Now it is partly used as a restaurant with a beautiful courtyard with fountain and summer houses, pretty tables for dining by candlelight and distinctive places within the premises furnished in typical Bavarian style. Germany was interesting, a place I’d definitely go back to visit. Nice people and really awesome looking villages. This entry was posted in Germany and tagged Der Schoene Brunnen, Frankfurt, Heilig-Geist-Spita, Lorelei, middle rhine, Nuremberg, Regierungsbezirk Lower Franconia, Rhein-Hunsrück-Kreis, rhine river, Rhine River Cruise, Sankt Goar, St. Lorenz Church, unesco world heritage, Wurzburg. Bookmark the permalink. Thank You. 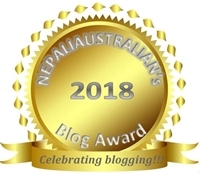 I love this post and wonderful photos. We have made many trips and road trips to Germany. 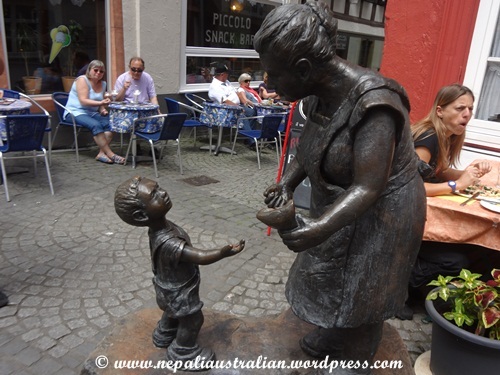 Mostly we have visited Frankfurt, but also we have seen Lorelei also when on road trip. ufff…that’s why we do not join tours…strict scheduling! However, it looks like the strict scheduling allowed you two to experience many sights! Charging to use the public restrooms helps keep them clean, lol. That is so true Frances, tours are so tiring with all timing and all but at the same time it was nice to see so many paces in such a short time. Very beautiful! It is amazing how things don’t change much in Germany. The buildings seem to always look story book perfect. I love that. Lovely, lovely photos as always. Such an enjoyable tour, and lovely photos. Thank you for sharing. hahahaha pay for toilett. Thats Germany! 😉 I know that. At the highway one time I payed 1 Euro. Can you imagine for that? Actually Frankfurt I dont like so much. I think the city is to noisy. Our castles are so interessting and mystical….right?